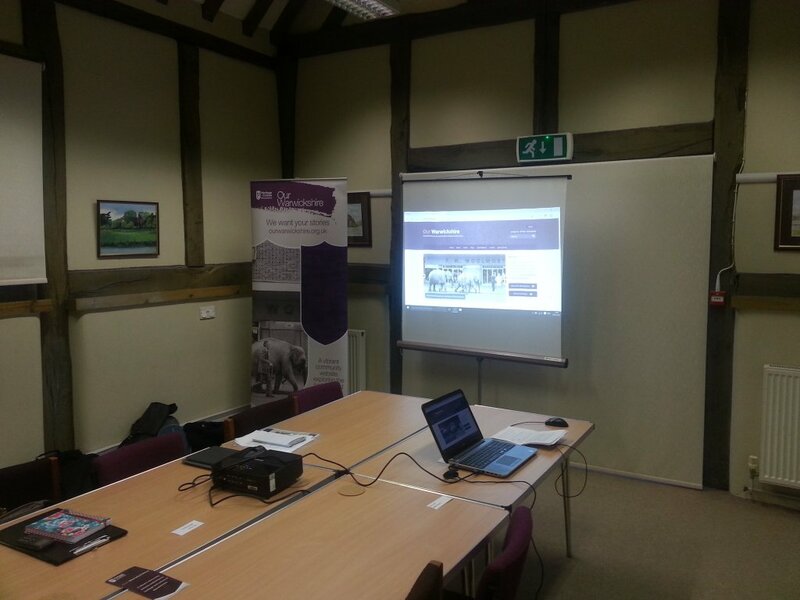 Ready to go at Polesworth tithe barn. 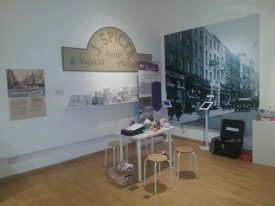 Prepping for the Through the Shop Window exhibition at Leamington Art Gallery. Artist in Residence, Chloe Meineck, has been appointed as part of the project. Chloe has an award winning background in design and craft, specialising in designing for social change. She will be working with the Heritage and Culture Warwickshire (HCW) team to explore how her ‘Music Memory Box’ project can be utilised to display local people’s artefacts and memories of Warwickshire at the Market Hall Museum, on the Our Warwickshire Website, and out and about in the wider county community. Our Warwickshire digital inclusion workshops are well under way at Briar Croft, Orbit Housing’s residential home in Stratford-upon-Avon. This intergenerational project sees residents working with HCW staff, and volunteers from Stratford Grammar School to write down their memories for the Our Warwickshire website. the project aims to help participants develop important computer skills whilst engaging with local history. The Our Warwickshire website complements the physical enhancements to the museum by allowing people across the county to share their knowledge, stories, and photographs, or find out about societies and events. The website will grow as more and more topics are written by members of the public, creating a hub of personal and local histories that will serve to display the diversity of the county. The events to promote the Our Warwickshire website are under way. The sessions are a chance to see the website, find out how to get involved, and post new topics and photographs. Sessions include public drop-ins at Rugby, Polesworth, Atherstone, Kenilworth and Nuneaton libraries; talks to heritage groups and the voluntary sector Community Action Networks; and community events around the county. These have been led by a range of HCW staff, and continue to engage members of the public with the website and local history.